Latif Yahia (Arabic: لطيف يحيى‎, Laṭīf Yaḥīa; born 14 June 1964) is an Iraqi-born author and former combatant in the Iran–Iraq War. Two journalists have disputed this and other claims made by Yahia. 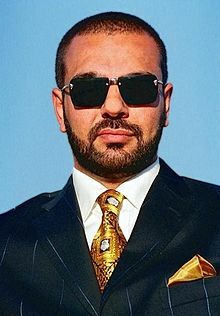 He is best known for being the alleged former body double of Uday Hussein, the son of Iraqi dictator Saddam Hussein. Of Kurdish descent, Yahia says he became Uday's double after the Iran–Iraq War had begun. He was born 4 days before Uday. At age 23, he was summoned to the presidential palace, where he discovered that Uday remembered that classmates had remarked on the resemblance between the two when they were in school together. Yahia was informed that he was to become Uday's fedai (body double) to make public appearances as Uday whenever a dangerous situation was expected. Yahia initially refused to take the job and was subsequently put in solitary confinement. After his imprisonment, Latif agreed to be Uday's double. He was trained for six months to imitate Uday's speech patterns and manner. He underwent surgery and dental work to make their appearances more similar. During the Iraqi invasion of Kuwait, Yahia was used as a morale booster for the Iraqi troops and sent to Basra posing as Uday to meet with troops. His relationship with Uday later deteriorated. According to Yahia, the final straw came when a woman Uday was interested in paid more attention to Yahia. Uday shot at him, grazing him. When ordered to kill the father of a beauty pageant holder, a defiant Yahia slit his arms in front of Uday and the father. Yahia fled north, where he was imprisoned by Kurdish Peshmerga, being mistaken for Uday. When they realized he was not Uday, he was released and granted asylum in Austria in 1992. After Yahia was attacked in Austria, he moved to London in 1995. On 10 March 1997, Yahia allegedly threatened a refugee official in Norway, showing up at his office with a can of gasoline, pouring it out over the floor, and threatening to light it. The official managed to "calm" Yahia, who fled after half an hour. He was subsequently arrested by the police. He was released before his trial and left the country, first to Germany, then to Ireland. Irish Times journalist Eoin Butler and Sunday Times journalist Ed Caesar have questioned Yahia's various claims, including that he was Uday Hussein's body double, and pointed out that many of Yahia's activities since leaving Iraq in 1992, including his education, have not been verified. In 2007, Butler interviewed Yahia and highlighted inconsistencies in many of Yahia's statements. In 2011, just before the release of The Devil's Double, Butler commented that Yahia's stories about when he was Uday's double were "to put it mildly, far-fetched." After the 2007 interview, Yahia's ex-wife contacted Butler and told him that when she first met Yahia, he used a different name, Khalid al-Kubaisi. After the two married, she heard for the first time that Yahia claimed to have been Uday's body double, which she found "dubious." In 2011, Caesar interviewed various people from the time of the Hussein regime. Although Saddam's purported use of body doubles was widely known, two confidantes of Uday Hussein denied that he used doubles. One said that Yahia was arrested for impersonation of Uday in 1990, and the other corroborated the incident, also stating that Yahia pretended to be Uday to pick up women. A private guard at Saddam's presidential palace from 1989 to 2003 also denied that Uday used doubles. Saddam Hussein's former doctor and a plastic surgeon at the Ibn Sina hospital said that the reconstructive surgery Yahia claims to have undergone there was never performed. The doctor also said he operated on Uday many times and Uday never had a body double. A former CIA case officer in Iraq, who claimed to know every asset in Iraq at the time and had friends who were close to the Hussein brothers, had never heard of Yahia, nor heard of Uday ever using doubles. Yahia disputes these claims, saying that his very existence was a state secret. Saddam Hussein himself, when asked during an interrogation session about whether any in the Iraqi government, notably his son Uday, used body doubles, went on to deny these claims, stating, "I think my sons would not do this." The movie The Devil's Double, directed by Lee Tamahori and starring Dominic Cooper as Yahia and Uday, premiered at the 2011 Sundance Film Festival on 22 January 2011. Yahia was also the subject of an episode of National Geographic Channel's Locked Up Abroad in 2012. I was Saddam's Son released on 1 May 1991 by Arcade Publishing. Hardcover: 250 pages. Co-author: Karl Wendl. The Devil's Double released on 5 June 1995 by Arrow Books Ltd. Paperback: 334 pages. The Black Hole released on 20 November 1996 by Arcanum Publishing. Paperback: 224 pages. The Hangman of Abu Ghraib released on 20 November 1998 by Arcanum Publishing. Paperback: 484 pages. ^ a b "بديل عدي صدام حسين يروي لـ "الوسط" . قصة نهب الكويت وقصة تابوت الذهب". Al-Hayat (in Arabic). 17 October 1994. Retrieved 27 May 2016. ^ a b c "Being Double to Saddam's Son More than a Job". The Daily Courier. Yavapai County, Arizona. 5 November 1995. p. A12. Retrieved 14 January 2012. ^ "Uday Hussein was 'worse than a psychopath'". Hardtalk. BBC News online. 1 December 2009. Retrieved 14 January 2012. .
^ "Truet på livet av 'djevelens dobbeltgjenger'". Avisa Nordland (in Norwegian). AN. 7 April 2010. Retrieved 29 January 2012. ^ Folkestad, Knut; Lysvold, Susanne (29 January 2012). "Han truet flyktningansatte i Bodø på livet – nå kommer filmen om djevelens dobbeltgjenger". NRK (in Norwegian). Retrieved 29 January 2012. ^ a b Caesar, Ed (23 January 2011). "The Double Dealer". The Sunday Times. Archived from the original on 26 April 2012. Retrieved 14 January 2012. ^ a b c Butler, Eoin (13 August 2011). "The Tangled Tale behind The Devil's Double". The Guardian. Retrieved 14 January 2012. ^ Yahia, Latif (14 January 2012). "Dirty Tricks and Media Manipulation". Official Website of Latif Yahia. Retrieved 3 February 2012. ^ "Lionsgate and Herrick Take on The Devil's Double". ComingSoon.net. CraveOnline. 3 February 2011. Retrieved 5 July 2011. ^ "Hellish Prison Cell". Locked up Abroad. National Geographic Channel online. 2 April 2012. Retrieved 2 May 2012.